Since Microsoft is giving away free Windows Phone handsets to Android malware victims, one might think that its platform is free of vulnerabilities, but that doesn't seem to be the case. Apparently, all it takes is a text message to be sent to a Mango device for it to start misbehaving. By sending a text message to a Windows Phone user, an attacker can cause the victim's device to crash. What the text message must contain in order for the bug to be triggered is not clear. Once the smartphone is turned back on again, its Messaging hub becomes inaccessible. 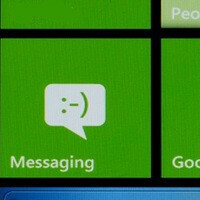 Chat messages sent via Facebook or Windows Live Messenger reportedly work as well. The cause for the bug is said to lie in the way the Messaging hub handles incoming texts. The vulnerability does not appear to be device-specific as it has been replicated multiple times on different Windows Phone handsets, such as the HTC Titan and the Samsung Focus Flash. Besides, both the 7740 and the 7720 build versions of Mango are said to be exposed to attacks. At this time, the only to get an affected device working again seems to be performing a hard reset. Thankfully, Microsoft has been made aware of the issue, so we hope that a patch gets released soon. Below is a video of the attack in action, so feel free to take a look. Coincidence that right? How much does Google spend on hacker's to find vulnerabilities in WP7? From Eric Schmidt can expect everything. Take that windows phone !! Your OS is still buggy and you dare to say that Android is full of malware.. Look at yourself in mirror first !! Yes and google has said their programs have contained a virus that affected asian phones. Fake! its an image and a programmer is not so stupid to tell you move out of the error by pressing Alt+Ctrl+Delete when the buttons dont exist are u....? 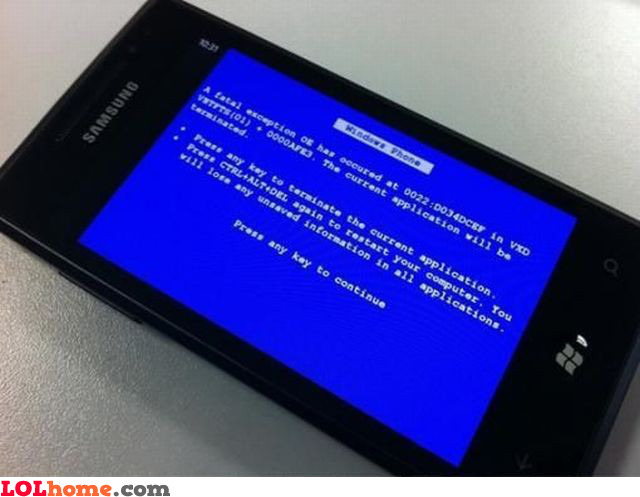 That image is somewhat a humor attack towards Windows phone via crash notification on PC's, obviously its a fake one. . . Apparently you guys did not get that this does not happen with a normal SMS message... Android is full of issues due to the crazy surge of popularity and the open nature of their market / software. Every piece of technology built can have their OS tampered with, just seems not to happen on the WP7 platform. But it is capable, and maybe even too easy... I'm sure MS will act quickly. I still remember the SMS of death for Nokia handsets. It's neen a long time since messages were deadly for phones, though. This happened to me and is the ONLY bug/imperfection/lag i have ever had on wp7, its the most streamlined system ive ever used. I just restarted my focus. Not only Windows phone having this issue My Galaxy S also having the same issue more then 2 times every weeks my phone suddenly off when it received new message. @ivanko34 First of all, this is a vulnerability, not a bug. It just means that WP7 isn't hacker-proof, which no OS is. Second of all, way to be stuck in the past. You're probably still using Windows XP and Windows Mobile 5. Windows 7 and Windows Phone 7 are both excellent operating systems, and there aren't many bugs. Microsoft has some of the most mature software around in general, so this argument is really moot. This is not a security risk. Sometimes the code just gets screwed up with certain combinations. One time a place I worked at had an employee profile for a system that crashed for no apparent reason. Everything was formatted multiple times and it still would not work. They checked to make absolutely sure and the coding was exactly as other profiles. The employees name was then changed by one space in the system and everything started working fine. Sometimes completely unrelated things screw up the system. Previous Android user. Complaints since moving over. Windows Phone Complaints 1) Live tile counter doesn't work most of the time for HeyTell, Facebook, GChat 2) Skype doesn't work in background mode. Android does. Makes app useless. 3) Messaging doesn't retain unsent text when switching to other app, home screen. Android does. 4) Can't view facebook like I can on my computer. Android does. 5) Reversing white background/black text for "night mode" like Nokia Maps does would be very nice in dark lighting, movie theather, etc. 6) Requires Zune to copy files off, unless emailed. Android solution is better, acts like a hard drive on USB 7) Auto-copy feature of pics to SkyDrive copies a small version of the picture, not the original size 8) Games that are for free on Android/iTunes cost money! Like Angry Birds. 9) Live Toggle Tiles like Connection Tiles don't update their wording when toggling 10) Market may have 10s of thousands of apps but a high number of them are just "hot girl" apps, missing many apps still! 11) Swype option is not available. Slydr option is a joke! 12) Volume hard buttons and Camera button don't always work when screen is off 13) Built-In "Listen for Music" option does not save what I find for music. Might as well just keep using Shazam/Soundhound 14) Scan barcode options should work like Google Goggles too. 15) Nokia Maps doesn't work in offline mode. Map doesn't load.